A short animated skit that may enlighten all those rugby fans who have been disappointed with the cancellation of this weekend’s PRO 14 Rugby…. Rugby And Pints: Not Always About Rugby And Pints The Irish Rugby Team. Hey – They’re People Too Alternate Irish Rugby Top Winners What!? 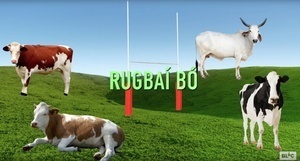 Posted in Misc and tagged cows, rugby at 2:18 pm on March 2, 2018 by Aaron McAllorum. Really milking this six nations vibe huh. Is there low-fat milk served at calf time?